Social Communication / Journalism. School of Communications, Federal University of Rio de Janeiro, Brazil (1996). 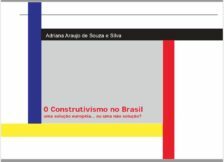 This Monograph analyzes the development of constructivist design in Brazil through its European antecedents: the functionalist movements (De Stijl, Russian Constructivism, Bauhaus and Suprematism). I show how the Escola Superior de Desenho Industrial (School of Industrial Design) synthetizes, within its own story, the history of Brazilian design. I also show how Brazilian designers took this constructivist perspective to create a national “Brazilian” design via the case study of the Domingo magazine. Finally, through the study of history, we may find approaches to the future of the constructivist design as a Brazilian (or European) way of understanding the organization of our spaces.